Did you ever wish you could get travel photos like the ones in the magazines? Get discouraged when your images don't look like the pro's? Well, guess what – me too! Regular tours and vacations hours set you up for travel photography failure! It's NOT you! Awesome scenery – not so awesome light! So I wanted to write this is for two reasons. First, to ask you to please stop beating yourself up because your travel photos don't look like the magazine ones. Secondly, to give you a few options and ways to make it work within normal travel restrictions and limitations, so you can come home with a few images you're really proud to share. Here are a few of my travel photos that turned out less stellar than I had hope, and some shots of the same locations by photographers that had a lot more success than I did! When I heard we were going to be heading to the Oregon coast this past July I kept hearing about “the” beach that everyone says is the most photographed beach, iconic Oregon. 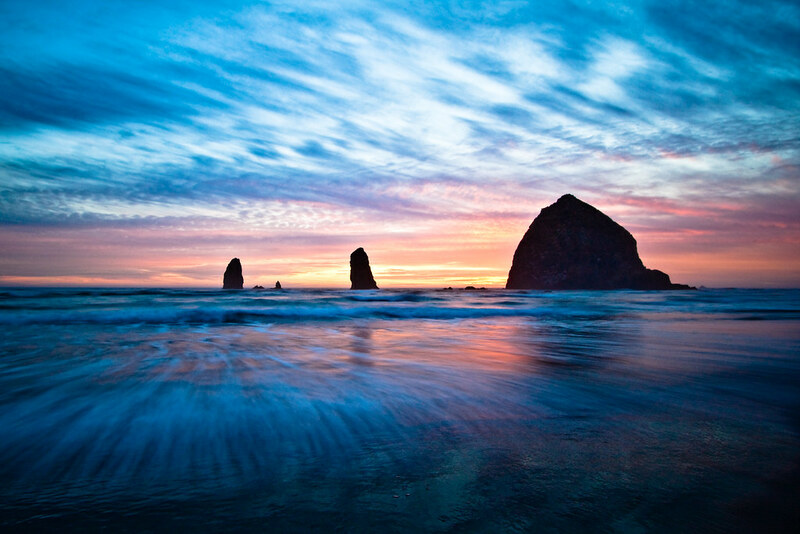 I researched it and found out Cannon Beach is the one to see. So we planned our tentative itinerary with us spending one night in that town and me hoping to capture a fantastic sunset. It didn't quite turn out that way. I wrote about my experience of trying to get a sunset shot at this beach in the article – Do you have Photography Compulsion Syndrome? Short story is our journey was delayed and we spent longer at some earlier stops and didn't get there until almost sun down. There was an amazing pink cloud hovering over the hill by the beach and I practically jumped out of the car to go get a photo of it. I felt the need to get something, anything of this beach, I had such high hopes for. This is what I got – less than stellar. Chairs set up all over the beach. Didn't have the right spot to get the sunset and too many people all over the place. I needed to be here at least an hour or two earlier to figure out where to shoot from, then come back at sunset. 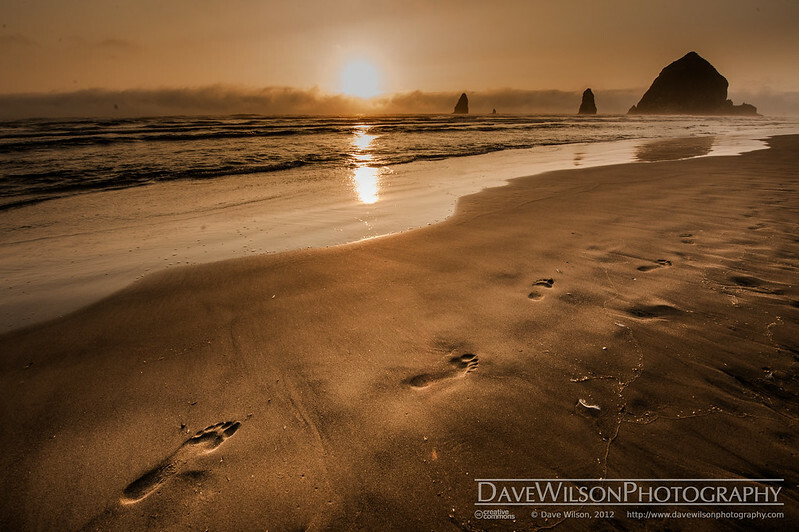 My Cannon Beach image – NOT what I had envisioned. Now here are some examples of some great images of this same location. Later on the same trip through Oregon I had planned a special detour to Palouse Falls in Washington state. It was sort of on our way home anyway and I had seen some spectacular images of the falls and wanted to take a crack at it myself. Once again our schedule got away from us and we did not get there 2 hours prior to sunset as I had hoped, we arrived as it was almost gone! Needless to say I had no time to go look around at all possible angles, the light was disappearing fast so I just shot from the regular view point. Of course I found out later that there is a trail that goes up around to the top of the hill so that you can see down the entire valley. THAT was what I had wanted, but once again I left feeling disappointed. This is what I managed to capture. Image by Jesse Summers – watch for an interview with him on his spectacular night photography soon! Image by Chip Phillips – watch for an interview with the guys from Photo Cascadia coming soon! Okay so having said all that above, if you are still limited by schedule or any of the other things previously mentioned, here are a few tips to help you come home with some good images in spite of it all. Look for good light anywhere and shoot there! Even in midday sun you will find little pockets of good light. Look for interesting things within that good light and photography them! Separate from your fellow travellers for a while if need be. Get up earlier, or stay out later than they do and go get the shots you want without the tag alongs rushing you. Shoot indoors at midday, or find shade. A good church or something architectural can work well when the sun is high outside. Travel light and carry zoom lenses so you can work faster. Don't be afraid to use semi-automatic settings like Aperture or Shutter priority to get the shot faster and move on. Best option – take a travel tour specifically designed for photography enthusiasts. This is the number one reason why I'm now leading photography travel tours! So we, as a group have control over when we shoot, and how long we stay in one spot. It also puts you in a group of like minded people where no one is hurrying you along or impatient. Check out the Photo Travel Tours page for more info on what's coming up, I'd love it if you could join us on one! I'll leave you with a few travel images from my trip to Turkey in 2011. It was a large group tour with all the challenges associated and mentioned at the top of the article. Yet I followed the tips above and was able to get several images I'm proud to display. I want to show you it is possible on regular tours, you just need to think outside the box a little. Skipped breakfast for an early morning walk to get this while my travel buddies were all eating. Met these kids while the rest of my tour was in a pottery factory and sale and I went for a walk down the lane. Look for good light – under archways and overhangs! This one is simple – share your travel photography images (successful and not so successful) with us, or join me on a travel photography tour!